A suit for the loss of a loved one due to the negligent act of another person is generally referred to as a “wrongful death” lawsuit. Understanding the wrongful death law in Wisconsin can be very complicated, especially when you are going through the grief and trauma of having recently lost a spouse, child, parent or another relative. 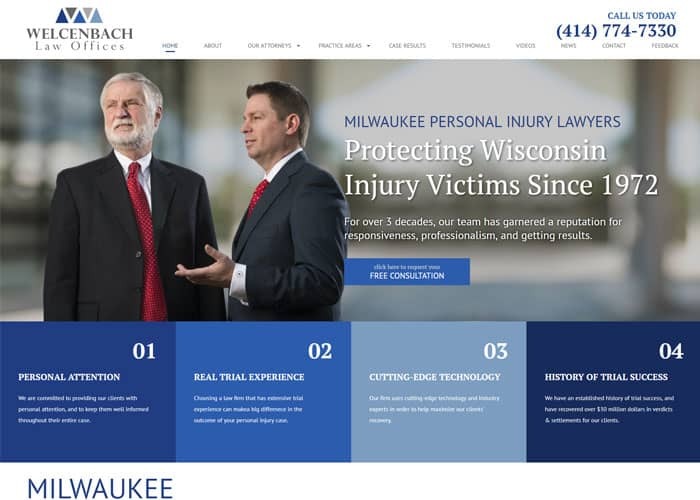 Our Wisconsin wrongful death attorneys at Welcenbach Law Offices have over sixty combined years of experience in handling wrongful death claims and also in bringing claims on behalf of an estate for wrongful death for the surviving beneficiaries. In Wisconsin, there are two types of claims for wrongful death. One is termed as the “survival action”, and the other is termed the “wrongful death” claim for “loss of society and companionship”. Our Milwaukee personal injury attorneys can assist you with filing the correct claim for your unique situation. The survival claim refers to the claims that can be brought on behalf of an estate, which would stand in the shoes of the person whose fatality has been caused. The survival action is brought by the estate, and the estate is entitled to recover medical bills, funeral expenses, lost income, lost earning capacity, and pain and suffering. In some cases, the injured person may have already started a lawsuit but then passed away due to the injury during the time that the lawsuit is pending. In this case, the estate will again step into that person’s shoes and seek to recover the past pain and suffering and other financial losses. The loss of society claim due to the wrongful death, on the other hand, is a claim that belongs to the person’s loved ones who are the beneficiaries under the Wisconsin wrongful death statute. Under the wrongful death statute, a limit of $350,000 for a deceased adult and $500,000 for a minor child is the cap for the total recovery. Again, this is not a per person limit but the total amount that may be recovered in addition to pecuniary or financial losses. One question is who has the right to file a wrongful death claim? In Wisconsin, it can be filed by the executor or the personal representative of the estate of a deceased person or by another person who has a right to damages for the loss of society and companionship, which is typically a spouse, child or parent. In the event of a minor child who is killed, then the parents would have the right to recovery. If the deceased was an adult and was married, then the claim would be held by the spouse, but the statutes say that if there are minor children, then part of the spouse’s recovery can be carved out to protect the minor children. The statute of limitations for a wrongful death due to a motor vehicle has recently been changed from three years down to two years under Wisconsin Statute 893.54 sub. (2m). Robert J. Welcenbach and his team of knowledgeable wrongful death lawyers understand the local and state laws that govern this sensitive legal area of personal loss. Many lawyers are unaware of this change in the law, and looking at their websites you will see that they continue to state that the statute of limitations is three years for wrongful death. You must be very careful that any wrongful death claim you have is filed within the correct statute of limitations, otherwise, your wrongful death claim may be barred entirely. In cases that are not involving motor vehicles, then the three-year statute of limitations would still apply for wrongful death. Typically, non-motor vehicle incidents where wrongful death cases arise is when there has been a fatality due to medical malpractice, nursing home abuse or neglect, workplace injury, products liability, pharmaceutical, train accident, or slip-and-fall accident. Punitive damages are not recoverable in wrongful death cases. This has been the law since 1980 when the court decided Wangen v. Ford Motor Company 97 Wis. 2d 260. In order to recover for wrongful death, the injured person who suffered the fatality must be less negligent than the person who caused the injuries and who damages are being sought from. What Other Factors Must be Considered in Wisconsin Wrongful Death cases? Several other laws come into play discussed in wrongful death cases. For instance, a spouse who kills the other spouse intentionally will be treated as having no action under the wrongful death statute. Likewise, a surviving spouse who negligently kills their spouse cannot disclaim their wrongful death claim in order to pass ownership of the claim to the deceased heirs such as children or other relatives. Specialized rules regarding medical malpractice also apply including an increase in the amount of the cap and change and some additional substantive provisions. The wrongful death law is very complicated and at times unclear or inconsistent. For instance, a wrongful death case our firm handled recently went before the Wisconsin Supreme Court, which held that, even though there was a surviving spouse, that the surviving spouse would be treated as having predeceased the fatally killed spouse because they had not had a relationship for numerous years. By doing so, the Supreme Court allowed the minor child to have a claim under the wrongful death statute for the death of her father. There is no greater pain than the loss of a loved one. This is amplified when the death of your family member was needless or could have been avoided. You need skilled and compassionate representation in what may be one of the most difficult times in your life. When it comes to personal injury and wrongful death, experience does matter. Contacting the right advocate can make all the difference in the outcome of your case. Our dedicated attorneys are committed to seeking justice for your loved one and maximizing your compensation. Although a financial recovery cannot bring your family member back, it can help secure the future for the survivors. Call Welcenbach Law Offices today at (414) 774-7330 or fill out our convenient online form.